Hey Everybody! It’s Meredith in for Missi in the continuing adventures of Missi and Meredith In Vegan Wonderland!! ! Hello best friends. This is Meredith in for Missi. Missi got a job, woo hoo, filming The Mentalist this week; which has made her incredibly helpful and handy in the kitchen. Glad I got that off my chest. So, this week, I took over the blog, the kitchen, and the menu for this week’s Vegan adventures in Lost Angeles. Side Note: Since I’m already here and all I thought it might be nice for you to hear my side of the story. I drove from Texas to Los Angeles, with father Frank, who still doesn’t know where he is, to come and live with my sister. Upon arriving, Missi announced that she was going to try Veganism during our stint in Alicia’s house, which BTDubs is amazeballs! Being that I had just spent two days in the car with Frank, learning all about Southwest vegetation and overdrive buttons, my defenses were down and I agreed to join her in her Vegan quest. I did this without remembering that my last meal was a truck stop Subway and I had yet to get my California ritual: Animal Style Double Double. That I hadn’t tasted in years. Well, crap. Side Side Note: Okay I’m from Texas. I talk like it. And I eat like it. I come from cattle ranchers on one side of the family and dairy farmers on the other. So to say it hasn’t been easy is an understatement. Now, I know I haven’t been a non-meat eater for long but I have learned a few very important lessons this month. Number 1. NOT ALL MEAT SUBSTITUES ARE EQUAL. Number 3. If you see “Chicken-less” just turn and walk away. So what is a meat lover like me to do?? If at first you don’t succeed- fry fry a hen. Just kidding. Kinda. Or you can take a tip from Miss Silverstone and go straight to the “meat” a.k.a. “proteins” section of The Kind Diet for a solution. And boy did I find it. 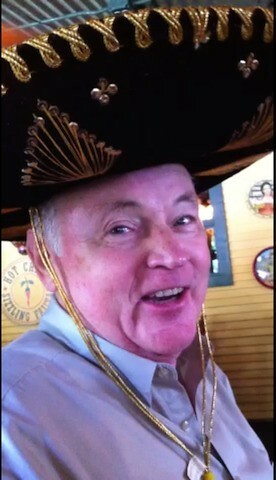 Tex-Mex style. Not only did I find a meat that tasted good, but it actually tasted like MEAT! Woo. Party. It’s the Chorizo found in Alicia’s Chorizo Tacos found on pg. 157 from The Kind Diet by Alicia Silverstone. Meat AND Mexican?? Done. Yum. First, I started by prepping all the Taco fixin’s. (That’s Texan for fixings). Side Side Side Note (last one, honest): Before starting this recipe, I searched endlessly for Tofutti Sour Cream and according to Carlos at Trader Jose’s it is discontinued!! How dare they! I’ve basically been LIVING on the Tofutti Cutie Faux-Ice cream sandwiches. So I had to improvise and replace Guacamole for sour cream to provide the creamy texture and appropriately give it some ‘ole Tex-Mex flare! I started with making the guacamole. As you can imagine, guacamole in Texas is a religion, everyone has their own recipe, which they swear by. And I’m no different. 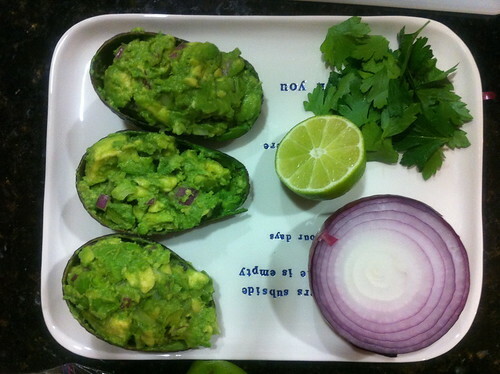 I use avocado, red onion, lime and cilantro. Mash up the avocado, dice the onion, add the cilantro and lime, a heapin’ of salt, and there you have it. Tex-mex guacamole. And here’s a fun serving tip, take the avocado shells you just scraped clean and put your mixed guacamole inside. Fiesta on a plate. This blog also features the very funny, very helpful, and young-brained Megan Park. She also has a job and had to work the next day but she learned her lines easily AND could also help in the kitchen. Youth is Amazing. After you make the guacamole, assemble more chopped onions, shredded lettuce, chopped tomato, cilantro, and Vegan cheddar cheese, and any other fixin’s you may desire. And now for the meat. Soy chorizo is the way to go. It comes in a tubey like concoction which is really gross and has to be squeezed into the frying pan in a bit of oil. Cook the chorizo for about 5 minutes and bring it to the table. I will say, the great thing about faux-meat is that it doesn’t require serious cooking. Just browning or warming. Hooray. The final result provided a beautiful display of colors and choices. While Megan and I made Tacos, Missi opted for a Tostada. So, if you’re a Texan and you find yourself hankerin’ for some meat, remember that a great Tex-Mex meal can quickly and easily be made Vegan (by careful faux-meat selection), without losing the taste and memories that remind you of home. Yay, Meredith! Side note, Tofutti still makes their soy sour cream, but you may have to get it at Whole Foods or another specialty store. What vegan ingredient hits home for you? Previous Postkind classics: even your nails can be kind!!! Next Postwhat to feed my dogs?